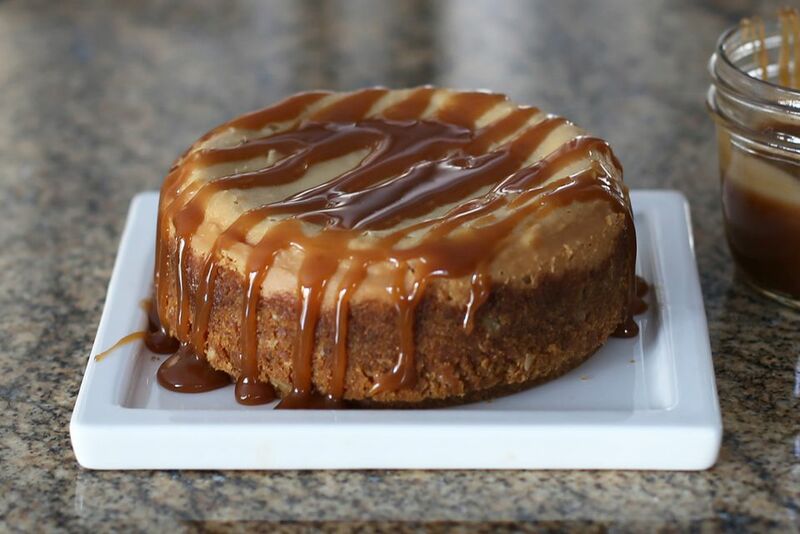 This is a delicious brown sugar cheesecake with pecan crust, cooked in the slow cooker. You might not think of the slow cooker when you think of cheesecake, but it really is an excellent cooking method. The slow cooker keeps the baking environment moist, and letting the cakes cool slowly keep them free of cracks. Using this method, you can convert just about any cheesecake to the slow cooker. Reduce the filling accordingly. Originally, I used a 7-inch springform pan in a 5-quart round slow cooker insert, and that size should also fit in a large oval. Or, two 4 1/2-inch pans (4 1/2-inch pan is shown in the photo) would probably work in an oval pot as well, or the cheesecake could be baked in the oven. See below for links to Amazon springform pans. Combine the crumbs and chopped nuts with 2 tablespoons of brown sugar; add the melted butter and mix until the crumbs are well moistened. Pat the crumbs into a 7-inch springform pan. In a mixing bowl with an electric mixer, beat the cream cheese and 3/4 cup of brown sugar together until smooth. Add the eggs, cream, vanilla, and flour. With the mixer on medium speed, beat for 3 to 4 minutes. Pour the cream cheese mixture into the prepared crust and place on a rack or ring of aluminum foil (to keep it off the bottom of the pot) in a 5 to 6-quart slow cooker (large enough to fit the springform pan). Cover the slow cooker and cook on high for 2 1/2 to 3 hours. Turn off and leave the cheesecake in the covered slow cooker for 1 to 2 hours, or until cool enough to remove. Place the cheesecake on a rack and cool completely and remove the sides of the pan. Garnish with pecan halves if desired. Spoon pecan praline sauce over each serving. Prepare the cheesecake as directed and bake it in a preheated 325 F oven for about 45 minutes to 1 hour, then turn the oven off and let it cool in the oven for about 4 hours.